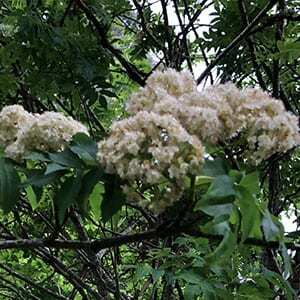 A number of Sorbus species are commonly known as the Rowan Tree, and Sorbus aucuparia along with others are also sometimes referred to as ‘Mountain Ash’ although not related to the Australian one. These are useful small deciduous trees that will reach around 7 – 8m in height depending on soil and conditions. Dark green pinnate foliage and masses of white flowers in spring, followed red berries and then by good autumn colour. These are a fairly upright tree that will form a rounded crown over time. Best in cooler climates, and they will require some additional water during long dry periods. Rowan trees are from the cooler parts of Europe and in Celtic mythology symbolise courage and wisdom. The bright berries are said to represent drops of blood of of the goddess Hebe, the goddess of youth and daughter of Zeus. Sorbus hupehensis – Good red berries and a tree that will reach around 6m in height. A good tree when given some protection from hot winds. Useful as a street tree where taller building provide shade in the afternoon. Also useful as a specimen tree.